The Clinton campaign has arrived on the small screen. 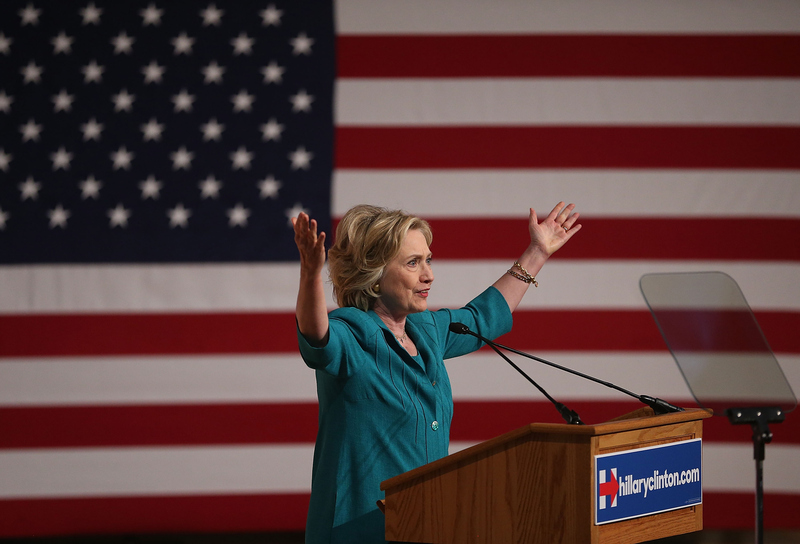 Hillary Clinton launched her first 2016 campaign advertisements, and they'll air on Tuesday. Viewers in early voting states Iowa and New Hampshire can catch Clinton's two new ads for five weeks. The ads, called "Dorothy" and "Family Strong," show Clinton as warm, but also a fighter when she needs to be. Together, they cost her campaign $2 million, with $1 million for each state, but that's a pretty lowball figure compared with some of her competitors. According to Fox News, Marco Rubio has already spent $12 million on ads. Later entrants into the campaign have spent less: $1 million from John Kasich and $500,000 from Chris Christie. Clinton's commercials might have been a political strategy to fight the ads that her fellow presidential candidates have made to criticize her. Rand Paul posted one through a website called Liberty Not Hillary, which contains a petition against her candidacy. It associates her with the failing Washington system. The Republican National Committee (RNC) released a negative ad called "Stop Hillary" to be aired solely on Fox News's Fox & Friends. According to Media Matters, Fox News gave $157,197 worth of advertising time to the RNC for free. Despite all that negativity, there have been a lot of positive Clinton ads through the years. They serve as time capsules for how Clinton and the nation's largest concerns have changed. Here are Hilary Clinton's eight most motivating campaign ads. Clinton sounds a little inexperienced here, as her last political role was First Lady. Still, she's pretty endearing. This ad just makes me so happy that she won New York. You go, turn-of-the-millennium Hillary! OK, this one is admittedly a little creepy. The deep-voiced narrator and sleeping children scare me somewhat. But by the end, I feel positively about Clinton. The dramatic music in this slideshow makes it a feel-good ad. Though it's only from 2008, the commercial still feels pretty dated. Clinton had more experience by this round of campaigning. She tells viewers not to expect a typical political commercial, because she's got a lot to say to North Carolinians. In another talking-head video, Clinton subtly puts down Obama's lack of experience. Obama and Clinton are equally charming here. This video, like several aspects of Clinton's campaign, focuses on her mother, Dorothy. The ad expresses the idea that Clinton will fight for all hardworking mothers. "Family Strong" shows Clinton's maternal side, and her commitment to family issues. It highlights her time with the Children's Defense Fund, her fights for school reform, her influence on healthcare reform, and her time as secretary of state. She says, "I believe that when families are strong, America is strong."